Walton Olvio MM19j was launched in February 2019 & runs on Java. 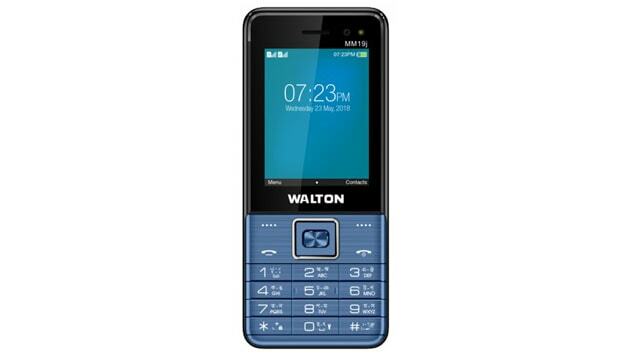 This feature phone comes with a 2.4-inch screen display and resolution of 320 pixels by 240 pixels. This phone comes with a Digital Camera with Flash as well as Digital Camera front shooter for selfies. The cell phone comes with three color options Blue, Golden and Black.Its connectivity options consist of Bluetooth, Micro-USB, FM and 2G. you can expand it up to 32GB via a micro SD card. The Walton Olvio MM19j is powered by a large 1500mAh removable battery that measures 125.9 height * 52.50 widths * 11 thickness plus weighs 0.00 grams. It also includes a dual SIM to support Normal-SIM and Normal-SIM.